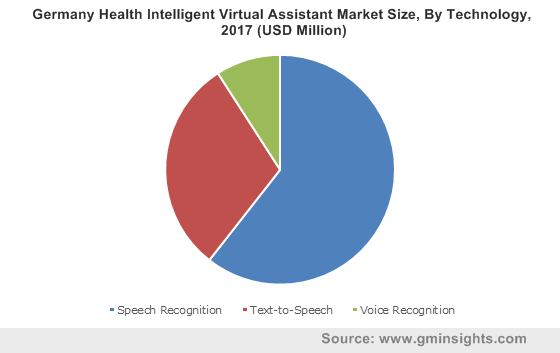 Health Intelligent Virtual Assistant Market size was valued at USD 226.2 million in 2017 and is expected to witness more than 33.7% CAGR from 2018 to 2024. Growing usage of smartphones is one of the major factors driving growth of the market. Mobile healthcare technology is being increasingly adopted by people all over the globe. With increasing need for cost cutting in healthcare industry, the providers are adopting m-health technologies for health monitoring to save large amount of healthcare costs. Increasing adoption of smartphones for healthcare services by physicians will drive business growth in the future. Increasing inclination towards internet of things will boost market growth during the forecast timeframe. Internet of things can be applied from remote monitoring and medical device integration to smart sensors and improve physicians’ delivery care. Implementation of IoT in healthcare facilities will expand reach of healthcare services and personnel. Gaining popularity for internet-connected devices among patients will positively drive the market worth. Speech recognition market is estimated to reach USD 1,023.6 by 2024. High growth rate is attributable to advantages of speech recognition such as increasing productivity and decreasing the cost. Speech recognition technology enables the physicians to record the data and instructions in the electronic health record very easily. Various advantages of speech recognition systems and continuous technological improvements will foster industry growth in the future. Text-to-speech market will expand at 33.3% CAGR across the projected timeframe. High growth is due to various technological advances and growing adoption rate. It enables surgeons and doctors to record important physiological parameters such as heart rate monitoring. 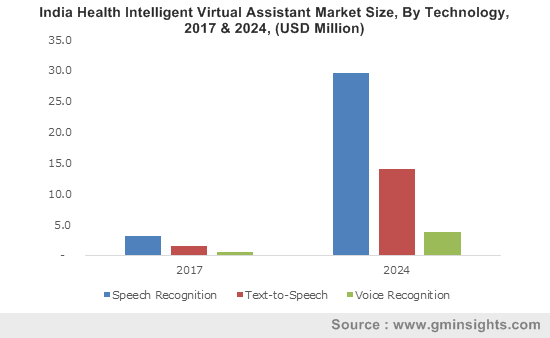 The use of Text-to-speech technology in intelligent virtual assistants offers various benefits for home healthcare ranging from reading prescription labels to providing instructions regarding use of medical devices, thus driving market growth. Payers business will reach USD 664.0 million by 2024. Market growth is attributable to increasing adoption rate for cost reduction and improving patient care. The use of these virtual assistants furnishes the payers with entire patient data of all the patients to evaluate and improve the workflow. the use of intelligent virtual assistants by payers will help them to easily coordinate, thus favoring segmental growth in the future. Providers’ market will grow at a remarkable CAGR of 34.4% across the forecast timeframe. By using this solution, healthcare providers create personalized health assistants for their patients that will support them to ensure that patients follow the prescribed treatment plan. The use of virtual assistants by providers helps them to focus more on their core task of delivering quality patient care. This will positively influence market growth in the upcoming period. U.S. market is estimated to reach USD 559.6 million by 2024. High usage of smart phones, use of health apps and rapid adoption of innovative technology will drive the market in U.S. The advances in telecommunication technology and highly developed infrastructure for using health intelligent virtual assistants in the U.S. will boost regional growth in foreseeable years. India health intelligent virtual assistant market is forecasted to expand at a CAGR of 37.9% across the forecast timeframe. Rising pervasiveness of chronic conditions is the region and need for better disease management will augment regional growth. these virtual assistants find their usage in customer service applications related to healthcare industry. Favorable government policies and growing per-capita income will boost industry growth. 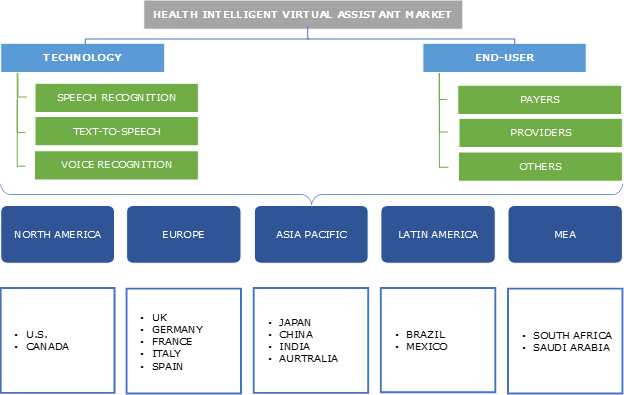 Few of the notable industry players operating in global health intelligent virtual assistant market are CSS Corporation, eGain Corporation, idAvatars, Kognito, MedRespond, Microsoft Corporation, Nuance Communications, True Image Interactive, Inc., Verint systems, and Welltok, Inc. These companies adopt strategies such as novel product launch, mergers and acquisitions to foster business in health intelligent virtual assistant industry. For instance, in January 2017, Welltok announced a strategic partnership with TeleTech Holdings Inc. to help population health managers guide consumers to optimal health with a more personal touch. This partnership will enable the company to diversify its service portfolio and expand its business. Intelligent virtual assistant and artificial intelligence are transforming the healthcare sector. Numerous upgradations and new product launch are done in intelligent virtual assistant for application in healthcare settings. 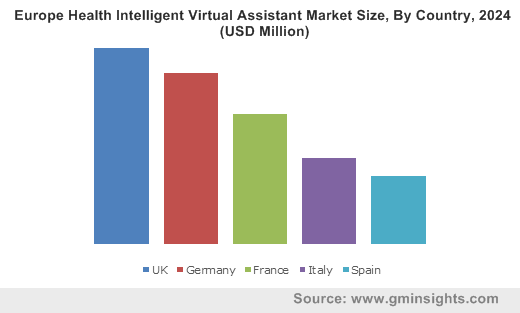 Health intelligent virtual assistant market is witness significant growth due to increasing adoption across various healthcare institutions and growing technological infrastructure. Predictive medical care, personalized medication, improved diagnosis, advanced treatment plans and long-term cost saving are few of the advantages associated with artificial intelligence and intelligent virtual assistant. Increasing burden of chronic conditions along with growing healthcare infrastructure across the globe will lead to higher adoption of intelligent virtual assistant in healthcare sector. Market is dominated by few of the larger companies, however, a high influx of new entrants is expected as the cost of entry in the market is low. With advancements in existing technologies, health intelligent virtual assistant industry will offer high growth opportunities in near future.